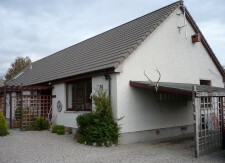 Deer View B&B was built in 2003 and is situated on the road that leads to Loch Killin; this is 9 miles from Fort Augustus and 3½ miles from Foyers on south Loch Ness. We are surrounded by breathtaking views from all around with an abundance of wildlife to see on your doorstep, from birds in the garden and the deer on the hill to red squirrels and pine martins. There are lots of walks locally and places to visit, from the Falls of Foyers to Urquhart Castle and the banks of Loch Ness, all with its beautiful views as well as its peace and quiet. There is also a local Hotel within walking distance which serves good food and fine ales. 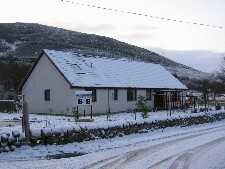 We are open all year including Christmas and Hogmanay and are pet friendly. We have four guest rooms available. All rooms have their own TV with Freesat, Video and DVD Player. There is one large bathroom with bath and shower and one small shower room, private dining / sitting room as well as a large dining room. We also have wireless internet access available for you to use so that you can keep in contact with friends and family whilst you are on your holidays. Please note that due to British laws, smoking is not permitted inside the premises of Deer View Bed and Breakfast. Planet Bed and Breakfast - a bed and breakfast directory assembled by actual B&B owners (over 200 to be exact! ).